With 24-hour programmability, this coffeemaker lets you choose when to brew. The unit automatically shuts off and has an audible beep when brew cycle is complete. The convenient Brew Pause feature lets you enjoy a cup during the brewing cycle and the easy to read water level indicator takes the guesswork out of measuring. It’s large capacity thermal carafe keeps up to 12 cups of coffee hot and fresh and features a patented Brew Through / Pour Through Lid that seals out air and seals in flavor. Coffee is 98% water. The quality of that water is as important as the quality of your coffee. If water doesn’t taste good from the tap, it won’t taste good in your coffee. While coffee is 98% water, all of the flavor comes from the beans. To achieve the same great taste you enjoy at a coffee bar, you need to use the same quality of coffee. If you choose to grind your own beans, buy them fresh and whole. Buy only about a two-week supply at a time, because once the bean is broken, its flavor degrades quickly. The grind is critical for proper flavor extraction. If the grind is too fine, over-extraction and bitterness will result. Too fine a grind may also clog the filter. If grind is too coarse, the water will pass through too quickly and the maximum flavor will not be extracted. When grinding your own beans, we recommend a medium-fine grind. Coffee that is too strong or too weak is always a disappointment. Follow the recommended portions of ground coffee in the instructions under Brewing Coffee, and later adjust the amount to suit your taste. 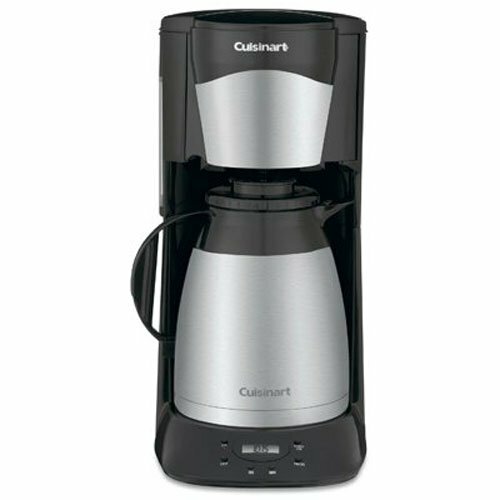 Note: The maximum capacity for ground coffee is 15 scoops (15 tablespoons) for this 60-ounce (twelve 5-ounce cups) coffeemaker. Exceeding this amount may cause overflow. Do not fill above the 12-cup mark. 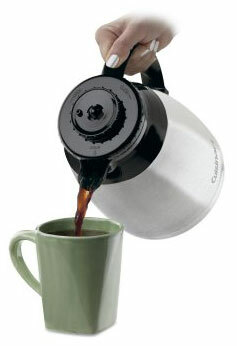 Brew-Through/Pour-Through Lid: Allows coffee to brew in and pour out of carafe without opening or adjusting. 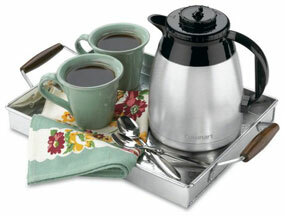 Keeps coffee hot and flavorful for hours. Reservoir Cover: Simply lift to fill with water. Close cover once water has been added. Filter Basket: Swings open for easy insertion of coffee filter. Water Window: Magnified markings indicate water needed to make corresponding cups of coffee. Brew Pause: Stops flow of water from basket when carafe is removed from heater plate, so a cup can be poured during brewing cycle. Auto-Brew Cycle: Program time to brew. ON Indicator Light: Illuminates when power is on. Before first use, flush out your coffeemaker. To do so, fill the reservoir with cold water and follow the directions for Brew Pause. Do not add coffee during this process. 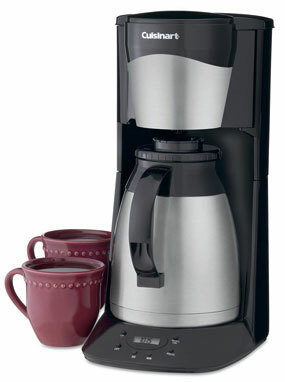 Once the system flush is complete, your coffeemaker is ready to brew. Coffee contains oils that can build up on your carafe. For best performance, wash carafe and wipe pour spout clean after each use. Only fill water to the 12-cup mark. Only use one paper filter or a gold tone filter - never both. Ensure the carafe lid is on correctly. Check to make sure the coffee is not too fine. Instruction booklet included. Please clean the valve regularly, especially if using flavored coffees as they can cause the brew pause to stick.